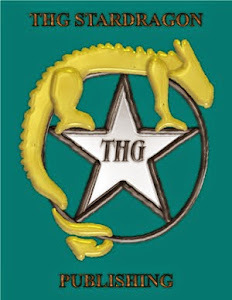 The THG in front of StarDragon is actually an important part of the name of the publishing company, as is the capitalization. The proper name is "THG StarDragon Publishing" and that is how it is written on official paperwork. THG are my initials from the time that I started going public with the enterprise, so those went in to differentiate my enterprise from any other StarDragon out there. Star and Dragon are symbols very important to me, thus they also went in. Thus, THG StarDragon Publishing. I don't know why those three first letters sometimes disappear.